Earlier in October, I went up to San Francisco for the weekend. The reason for the trip was to give a talk in the Berkeley Linguistics Department, but it was an excellent excuse to spend time in a city I like more and more. I arrived on Friday evening and met my friend Dustin for dinner. The place where we met was a stone’s throw from the Chinese restaurant where the banquet I went to before the premiere of Dream of the Red Chamber was held, but we ate at a different Chinese restaurant, which specialized in Sichuanese cuisine. We had mapo tofu and steamed fish over tofu with chopped chilies. I made my way by BART and bus to the Marina District, where I was staying with my mother’s cousin and his wife, whose wedding in Maui I attended last year. They very kindly introduced me to some of their favorite places to eat. On Saturday, we went to the farmers market around the Ferry Building for chilaquiles (which I had never tried) and porchetta sandwiches. Then they took me to Lands End. 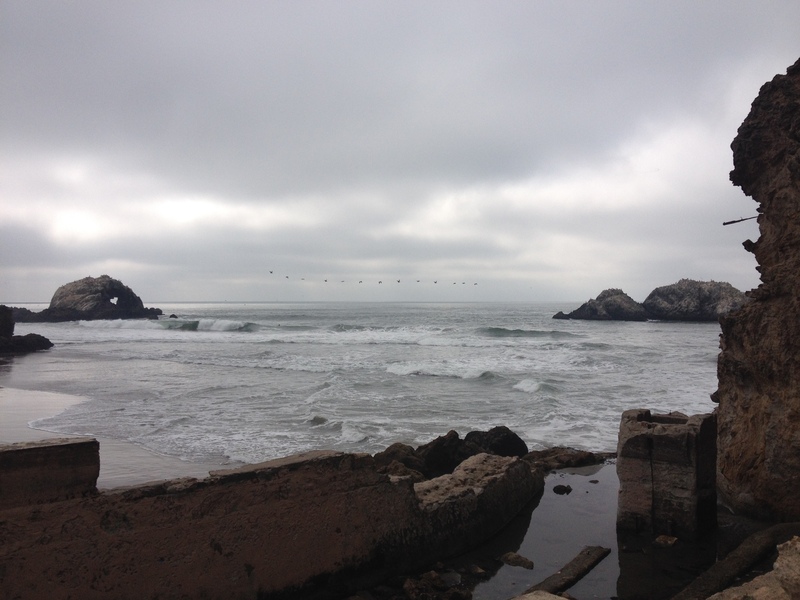 Beyond the ruins of the Sutro Baths, the tide was very low, and gulls and cormorants crowded on the rocky outcroppings just off shore. Here by the ocean it was cloudy, and the wind-sculpted conifers stood tall and eerie on the hillside. I spent part of the afternoon in Golden Gate Park catching up with my friend Katherine (alas, I did not get to see the bison paddock). Then in the evening my cousins and I went out for seven-course beef (bò 7 món), which I had also never tried (or even heard of). NO PHO, a sticker on the door of the restaurant proclaimed, and inside every table had ordered the specialty. The meal consisted of seven courses of beef in different forms, including a salad at the beginning and congee at the end, passing through various iterations of thinly sliced beef and ground beef sausages. Most of the meat was meant to be rolled in lettuce and/or rice paper wrappers with vegetables and herbs. It was fun and very tasty. On Sunday morning, I went to church with Katherine. It was the Indigenous People’s Day Service, and the sermon was partly about the Nez Perce translation of the Gospel of John and the Nez Perce story of Coyote and his daughter. After church, my cousins and I drove to Berkeley, where we ate an Indian restaurant/market specializing in chaat. I had a mango lassi, and we shared a bunch of dishes served on metal trays. These included lamb biryani, masala dosa, puri, a puffed rice dish, fried fish, and bhature (a.k.a the big puffy thing), with a variety of sauces and accompaniments. My cousins dropped me off at my friend Jesse’s place, and the next day Jesse and I went into the Berkeley department. I spent the morning at the Free Speech Movement Café and then returned to give my talk, which was on a couple of my dissertation experiments. Afterwards, I went out to lunch with some of the Berkeley folks, including my friend Andrew. Then I made my way back to the airport to fly back to Los Angeles.